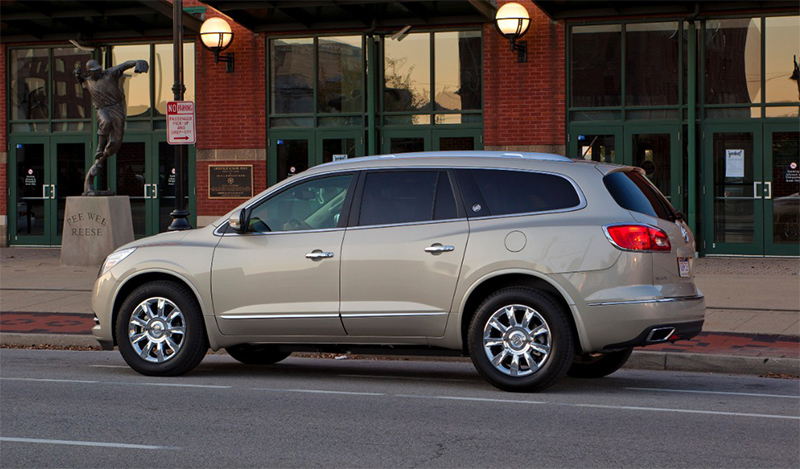 The award-winning Buick Enclave continues to draw accolades and bring new customers to the brand for its outstanding design, performance and safety features. The three-row luxury crossover that forged the brand’s renaissance saw its best year ever in 2013. Recent accolades include Kelley Blue Book’s 2014 5-Year Cost-to-Own award for the full-size luxury SUV/crossover category. Enclave continue to outsell rivals including Lincoln MKT, Volvo XC90 and Infiniti QX60 with its state-of the-art features, capability and safety offerings such as the industry-first standard front center air bag, forward collision alert, lane departure and text-to-voice technology. It is also designed to comfortably accommodate three rows of adults and provides more third-row leg room than the Infiniti JX, Acura MDX, Lincoln MKT, Audi Q7 and Volvo XC90. For the 2015 model year, Enclave offers a new heated wood steering wheel. It is standard on Leather and Premium models – and adds another luxurious detail to the inviting interior. The Enclave’s exterior and interior color palettes have also been refined for 2015. A new Dark Plum interior color is available, as well as four new exterior colors: Crimson Red Tintcoat, Dark Sapphire Blue Metallic, Dark Chocolate Metallic and Midnight Amethyst Metallic. all models are powered by a direct-injected 3.6L V-6 that delivers an EPA-estimated 24 mpg on the highway (FWD models). The Enclave is instantly recognizable as a modern Buick, with sculpted styling and signature elements such as a black-chrome waterfall grille complemented by technologically advanced features, including signature wing-shape LED lighting. Monochromatic paint schemes accented with chrome contribute to the luxury crossover’s premium appearance, along with large 18-, 19- and 20-inch wheel designs. At the front, LED daytime running lamps and accent lamps give the Enclave a strong presence on the road. Blue translucent rings around the standard Xenon HID headlamps are Buick design cues found on other models, adding distinction across the brand’s lineup. Articulating headlamps are part of the Premium model’s package, which also includes power-folding, heated outside mirrors, as well as interior features such as power tilting/telescoping steering column and heated/cooled front seats. A chrome finish within the rear fascia frames the exhaust outlets, for an integrated appearance that exemplifies Buick’s attention to detail. LED-accented taillamps give the vehicle a distinctive signature at the rear that reflects Buick’s elegance. A power-operated liftgate is standard. Exterior color choices include: Crimson Red Tintcoat, Dark Sapphire Blue Metallic, Dark Chocolate Metallic, Midnight Amethyst Metallic, Quicksilver Metallic, White Opal, Carbon Black Metallic, White Diamond Tricoat, Champagne Silver Metallic and Iridium Metallic. The Enclave’s interior is defined by luxurious amenities and high-quality materials, along with the intuitive technology of Buick IntelliLink. Rich, saturated tones and contemporary color combinations reflect Buick customers’ lifestyles and enhance Enclave’s sense of fashion. An exclusive Dark Plum interior color, for example, offers a higher degree of visual warmth. It is complemented by the soft feel of Nuance sandstone leather, which has characteristics similar to leathers used in premium home furnishings. Standard remote vehicle starter system. Enclave offers three rows of seating, available in seven- or eight-passenger configurations. The second-row seats feature the popular SmartSlide system. With the pull of a single handle, SmartSlide allows easier entry to the third row. There is 23.3 cubic feet (660 liters) of cargo space behind the third row and a maximum of 115.2 cubic feet (3,263 liters) of cargo space available behind the front row of seats. Buick’s signature QuietTuning engineering process, which uses laminated glass and extensive sound blocking and absorbing materials, makes Enclave’s cabin quieter than a Lexus RX350. Buick’s IntelliLink color touch radio is standard on all models and enhances the driving experience with a higher level of wireless connectivity and customized options – all while building on the safety and security of OnStar. IntelliLink is intuitive and easy to use, and includes the capability of setting up a “home page” for favorites. It integrates online services such as Pandora® internet radio and Stitcher SmartRadio™ using hands-free voice and touch-screen controls via Bluetooth-enabled smartphones. This builds on the voice-activated Bluetooth hands-free calling capability offered in other Buick models. Enhanced connectivity and convenience includes a Text Messaging Alerts feature for smartphone users with Bluetooth profile (M.A.P. ), which reads incoming texts through the vehicle’s speakers, and Siri Eyes Free for iPhone iOS 6 and iOS 7 users to enhance connectivity and convenience. Each enables voice-controlled connectivity, to help keep phones safely stored and hands on the wheel. Supports playback of MP3 files stored on flash memory drives. 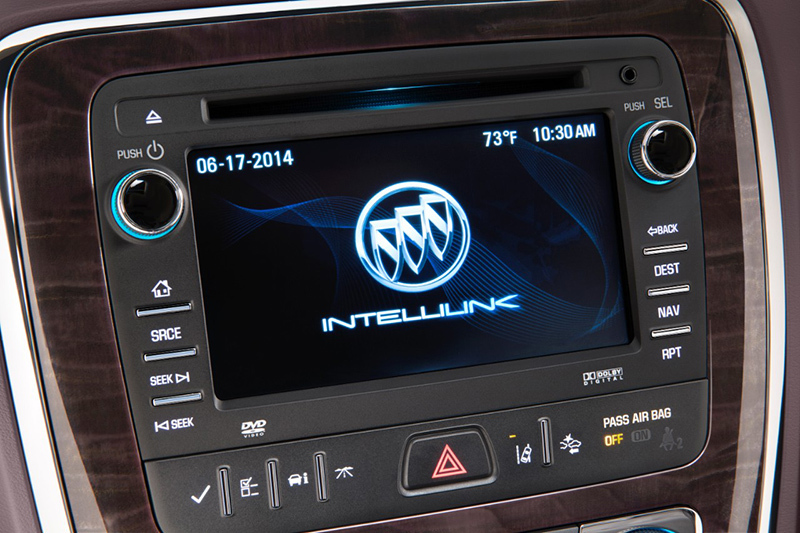 IntelliLink is standard on all Enclave models, including those with the available navigation system and DVD capability. The IntelliLink screen also serves as the display for the standard rearview camera system. A premium 10-speaker Bose audio system with 5.1 surround sound is available and is optimized for the Enclave’s refined interior acoustics. Enclave is driven by a 3.6L V-6 engine featuring fuel-saving direct injection technology and continuously variable valve timing, and matched with a six-speed automatic transmission. Direct injection helps the engine produce power comparable to a V-8 – SAE-certified 288 horsepower (215 Nm) and 270 lb-ft of torque (366 Nm) – with good efficiency. EPA fuel economy estimates of 17 mpg city/24 mpg highway for front-wheel-drive models are very competitive with other three-row crossovers and utilities. The strong V-6 engine also enables Enclave to tow up to 4,500 pounds (2,045 kg) when properly equipped, and it can be flat-towed in both FWD and AWD configurations. The available intelligent all-wheel-drive system provides increased traction on slippery roads by actively managing the torque distribution between the front and rear axles, based on factors such as wheel speed, throttle and surface conditions. There is no driver intervention; the system automatically decides how much torque to apply and delivers it to the wheels that have the best traction. Eighteen-inch wheels are standard and 19- and 20-inch wheels are available. The Enclave includes the segment’s first Front Center Air Bag. This feature deploys from the inboard side of the driver’s seat and inflates between the driver and front passenger, providing added protection for both front occupants in side-impact crashes. Standard safety features also include StabiliTrak, traction control, panic brake assist, rearview camera system and a total of seven air bags – including head-curtain side air bags covering outboard occupants in all three passenger rows. Enclave offers a number of camera- and radar-based safety features. They monitor areas around the vehicle and provide alerts to assist the driver in avoiding collisions. Side blind zone alert and rear cross traffic alert are radar-based, while forward collision alert and lane departure warning are camera-based. Forward collision alert detects a possible crash threat and alerts the driver, giving him or her extra time to stop and/or change course. With side blind zone Alert, the driver is alerted to vehicles in the blind sport during a lane-change or merging maneuver. Enclave’s standard safety features also include StabiliTrak, traction control, panic brake assist and a total of seven air bags – including head-curtain side air bags covering outboard occupants in all three passenger rows. 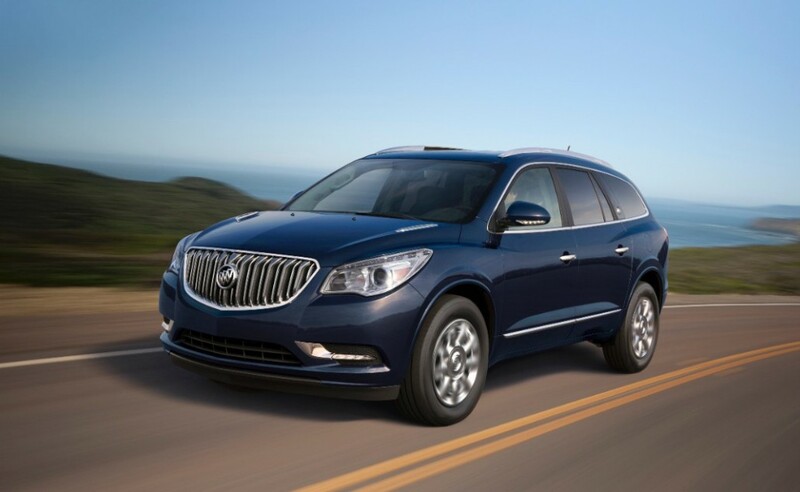 Six months of OnStar Directions and Connections service is standard on Enclave. OnStar is the global leading provider of connected safety, security and mobility solutions and advanced information technology. OnStar’s RemoteLink Mobile App allows smartphone users to control vehicle functions, access vehicle information and send directions directly to the vehicle. An opt-in service called FamilyLink allows subscribers to stay connected to loved ones by checking the location of their vehicle online or by signing up for vehicle location alerts. More information about OnStar can be found at www.onstar.com.